Rift users will get these features in 2017. A few months ago at Oculus' annual developer conference, the company announced a couple of social VR features known simply as Parties and Rooms. 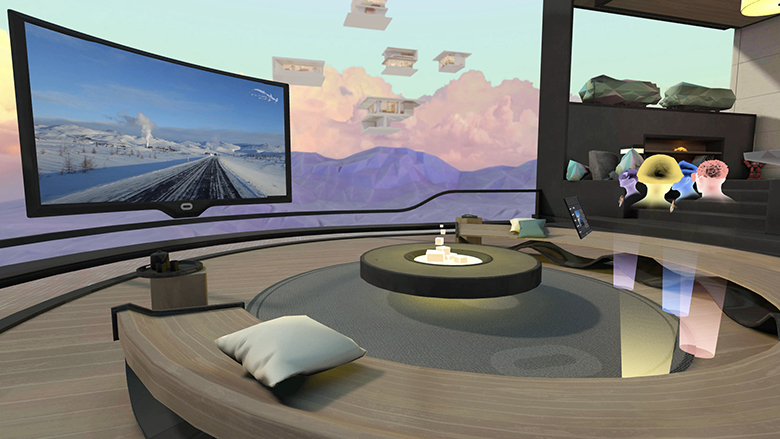 Parties is basically built-in voice chat, while Rooms is a virtual hangout space. Today, those features are finally live, at least for the Gear VR; Rift users will have to wait until 2017. Combined, Parties and Rooms are part of Oculus' continued efforts to prove that virtual reality can be used not just to play games, but also to connect people around the world. I had the opportunity to try out both features earlier this week in a short demo in San Francisco. Once I put the headset on and launched into the Oculus Home screen, the Parties interface appeared on the right. It looks very much like any other social-chat app; you can see a list of your friends as well as who's online at the time. You can also see the title of the game they're playing, if any. To start chatting, tap the Party tab, choose who you want to add and then hit "Start a Party." If you're invited to a party, joining is also as simple as tapping a button. 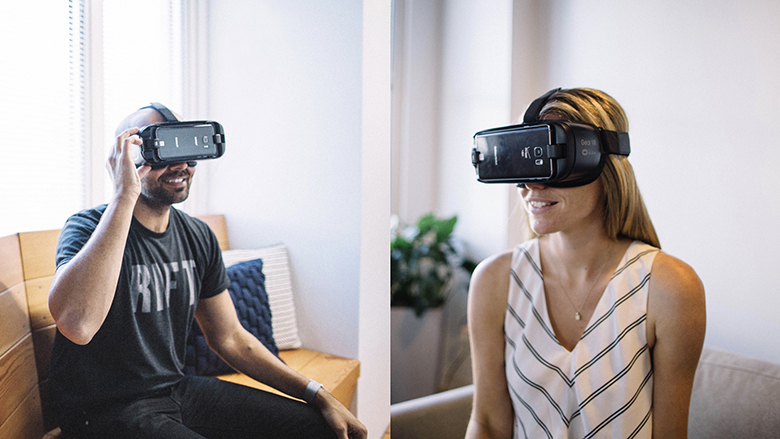 "Think of it like a phone call," said Madhu Muthukumar, a product manager for Oculus. Right now you're only able to chat with up to four people, though Oculus might increase that number in the future. But while Parties is like making a phone call, Rooms is akin to inviting your buddies over. Once you have your Party all set up, maybe you want to "see" and interact with your friends instead of just hearing their voices. If that's the case, you can join a Room right from the Parties interface. I was invited to a Room by Mike LeBeau, a product manager for Oculus who was in London at the time. As soon as I accepted, I was transported to a virtual living room of sorts. Before I knew it, I was hanging out with virtual avatars for both LeBeau and Muthukumar, and I, too, was an avatar. The virtual Room is separated into a few different areas. In one you can change the appearance of your avatars; in another, you can watch videos together. The tabletop area is where you play simple board or card games, and there's yet another space dedicated to just sitting around and chatting. In front of each avatar is a floating tablet of sorts, which essentially acts as your controls. You can also teleport from one area to another by selecting it with your gaze and tapping the headset's touchpad. What I found particularly interesting is that the virtual avatars moved around as they spoke. They would look directly at me as they were speaking to me, and their mouths moved in sync to what they were saying. LeBeau tells me that the avatar movement mimics what you're doing with your own head, thanks to the accelerometers and gyroscopes in the phone. Similarly, the mouth movement is synced to the sound the software picks up from the microphone. It seems odd to say this, but just those simple head and mouth movements made me feel like we were right there in the room together, even though we were in completely separate locations. Oculus has experimented with social experiences before, like Oculus Video, which allows people to watch movies together. But Rooms and Parties is the next step. "We want you to feel like being in VR is sort of the same as being in real life," said Muthukumar. "You can hang out, watch videos together, play games and talk with your friends." Additionally, if you get tired of the virtual avatars, you can also have the entire Party leap into a multiplayer game together, as long as the title supports it. Right now, Oculus' social efforts are completely separate from the social VR experience we saw from Facebook, where you could "travel" to locations together and take virtual selfies with your pals. Still, that's where Oculus also wants to be. "That's the aspirational push-the-envelope of VR. It's what we all hope it can be," said Muthukumar. "We both [Facebook and Oculus] believe that VR will be best when people connect human experiences." But to get there, you have to take baby steps, which is what Rooms and Parties represent. "It's cool to 'meet' someone who's literally all the way from somewhere else in the world," he said. "We're excited about it. We think there's some early magic here."